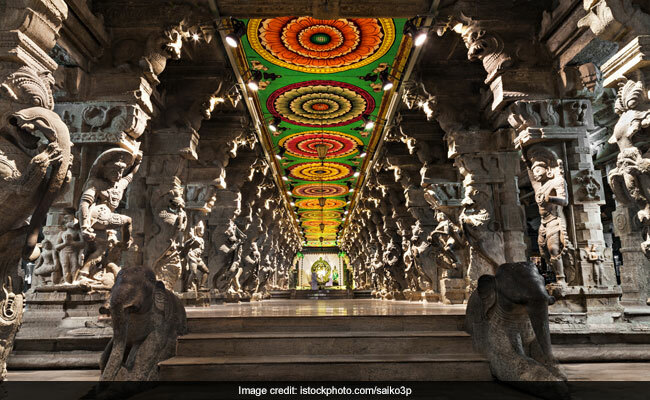 Meenakshi Amman temple in Madurai saw over 1.5 lakh devotees for celestial wedding. More 1.5 lakh devotees from various parts of Tamil Nadu converged on the famous Sri Meenakshi Amman temple in Madurai on Wednesday to witness the celestial wedding of Goddess Meenakshi with Lord Sundareswarar. The wedding is the highlight of the10-day annual "Chithirai" festival at the ancient temple. Special pooja is performed before the deities exchanged garlands at 9:52 AM as devotees chant the names of the God and Goddess. Authorities made arrangements for distribution of water, buttermilk and beverages to devotees to help them beat the summer heat. Chithirai Festival or Chithirai Thiruvizha lasts for one month of which the first 15 days mark the celebrations of the coronation of Goddess Meenakshi and the Marriage of Lord Sundareswara and Goddess Meenakshi, and the next 15 days mark the celebrations of the Journey of Lord Alagar from Kallazhagar temple in Alagar Koyil to Madurai. Chithirai festival has following events:Kodi Yetram(Chief priest of Meenakshi temple hoists the holy flag on the Dwajasthambam (flag post) of the temple.) After this comes Pattabisekam, which marks the coronation ceremony. Meenakshi is crowned the queen of Madurai on this day. It is followed by Dikvijayam, when Goddess Meenakshi, after conquering the world reaches Kailaayam (The Place of Lord Shiva in Himalayas) to conquer it. On seeing Lord Shiva, she fell in love with him and married him. Meenakshi kalyanam is the wedding celebration of Goddess Meenakshi and Lord Shiva as Sundereswara in Madurai. It is followed by Chariot festival or Ther Tiruvizha or Rathotsavam. The king and queen of Pandya Kingdom Lord Sunderaswara and Meenakshi come to see people in a chariot. Ethir Sevan is part of the Chithirai Thiruvizha of Lord Kallazhagar temple at Alagar Koyil. On this day, Alagar change his appearance as Kallar (Kallar vedam) when he travels via Kallar Nadu and enters Madurai city and the people of the city welcome him.